Mr Dean came to us last summer from the SPCA. He was seized from his family for living where he is illegal. When the SPCA van pulled up, I expected him to be in a kennel. The volunteer said, "Oh no, he's just loose in the back." I wondered how we were going to get him into his pen that we had prepared for him and the volunteer said, no problem! He opened the sliding door, slipped a leash that was clipped to itself over his neck and Mr. Dean popped out of that van and walked right over to the pen like he'd done it a thousand times before. He is such a well behaved pig and he's very easy going. We introduced him to Tavia's babies because they are all about the same age, but the babies (The Muchachos we call them) made his life miserable, not allowing him to share the mini barn. I couldn't have him sleeping out in the open, so we started bringing him into the kitchen at night. He was quite happy to spend his days in the pen and sleep inside at night. He's an expert nest builder, and while he was getting acclimated to the house he started searching for things to add to his epic nest. He pulled things out of a cabinet- an old toaster, some tupperware and my electric popcorn popper. I kept putting the things away and he was ok with that- except for the popcorn popper. No matter how many times I put it away he would pull it right back out again and add it to his nest just so. I finally gave up and let him have it, and it remains there to this day. 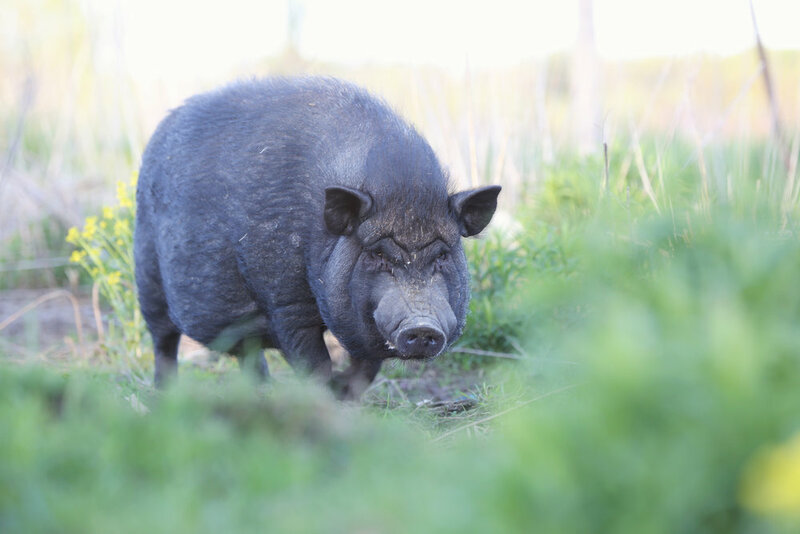 He's mostly integrated into the housepig herd, able to be out roaming free with them during the day, but Tavia still tries to intimidate him, making him cry like a baby at least once a day. He's very independent, and incredibly smart.